I don't think there's any problem with the arrows at the moment. People just aren't reading which we can't do anything about. It's been made more than clear with both words and visuals. AndyDufresne wrote: Much debate occurred about the arrows, and I think they are suitably understandable for game play. Other's thoughts? i think this map is terrible... The graphics are sub par for what is expected in the foundry..
For the most part, the borders are crisp and clear; but in some places there is pixellation/fuzziness (eg. Newton/Cloverdale). In a couple of spots, the borders don't meet cleanly (eg. Boundary Bay/Burns Bog or Aldergrove/Campbell Valley/Glen Valley). As mentioned before, there are a number of places where the text overlaps territory names. You could either resolve this by moving some borders slightly, reducing the font size a little, or possibly even finding a new font altogether? Some of the text on pale areas of the map (Burnaby) is difficult to read. It might be worth playing around with an outer glow on the text instead of just a drop shadow. The purple (pink?) line runs very close to the coast in the yellow area; if you can pull it away from the terrtory edge a little, it will be more obvious that the territry extends beneath it, and that the train line isn't a border. You could possibly add (or increase the distance) of the drop shadow, to make it feel more like the line is above the territory space. The colouring you've used on Downtown is a little bit confusing, and really doesn;t help visibility of the army number. Consider extending the colour around parts of the circle edge (you could split it almost three ways) - check out the train lines on NYC to see how the double-line-stations are done on there; I'd suggest trying to emulate that style as much as possible as people should be familiar with that concept. The legend is broadly functional, although I'm not sure how easy it is to match up the coloured blobs with the region colours. The order of regions on the legend doesn't seem to correspond with their positions on the map. The ports symbol doesn;t do a great deal for me, and looks more like a snowflake - this is entirely subjective really I know (think?) you had an attack line over the sea in an earlier version, but it would be nice to see how a narrow dashed/dotted line works now - you could use the current border line colour instead of white? I understand your concern, danfrank. I encourage you to become more active in the Foundry Process so you can help shape and form maps. 1. Legit concerns on the arrows have been discussed at lengh and have been agreed to have no real major concern overall. 2. This map has achieved graphically what it intended to. To create a crisp, clean map with straight forward graphics. Many people liked it that way and that is how in managed to make it through the foundry. It isn't sub par, only different. No two maps are created entirely equal... if every map had to look as good as the best looking CC map, we'd only have one map. Vancouver is a beautiful map in its own right, and is on the road to completion. As for this map, the biggest gameplay issue seems to be the way territories connect. I agree that if you read the legend everything is fine, but its become obvious that many people do not bother to read it and are then turned off by the amp. You can lead a horse to water but you can't make him drink, right? For starters, I have never liked (and I've said this a few times) that in some places on the image the text is transparent with a grey border, in some places it is black with a white border, and the arrows are a transparent grey with a litghter grey border. For me this has two results: 1) some elements seem more important that other elements, and 2) the image is not clean and balanced. By far the easiest on the eye and thus the most accessible text on the map are the territory titles - and they should be. But the arrows are given much less prominence than the territory titles and as a result are kind of lost in the image. Next, the text in the top right legend in uninviting. The white stroke on the letters makes the text run together, and its something of a chore to read. Knock the stroke down a point - and perhaps make everything a point size smaller - and the eye can fix itself on the text more easily. And since the part about Land and Sea do not connect is what folks are failing to read maybe that should be first, or somehow more prominent? And this is the last time I'll say that if the text in the two legends were given the same weight the map would be more visually in balance. And since the land/sea borders are impassable, have you given any thought to upping the thickness of the borders by a pixel? Right now they are the same weight as the conventional borders between territories, leading to confusion. Good map - attractive - very basic & easy to play/follow.. I like it as is......... Great job!! Would this work for you oaktown? Maybe I'm alone on this, but I think that these arrows look much better than the old gray ones... they now belong on the same image as the text. And if anybody complains that they didn't see the arrows now they should be thwacked repeatedly on the side of the head. If you really want to make this map idiot proof you could move "are" in the last line line of the legend up next to "regions" and put an example arrow next to the text. oaktown wrote: And since the part about Land and Sea do not connect is what folks are failing to read maybe that should be first, or somehow more prominent? I hate to be the bearer of bad news, but "Arctic" is misspelled "Artic" on the map depicting the bonuses. Despite that, I do believe I will try this map soon. It looks sharp and well thought out. ender516 wrote: I hate to be the bearer of bad news, but "Arctic" is misspelled "Artic" on the map depicting the bonuses. Despite that, I do believe I will try this map soon. It looks sharp and well thought out. thanks for the post and pointing that out. actually, it is correct on the uploaded map but I've just neglected to update the first post with the latest version. That's done now. Hope you enjoy the map. Does this work for everyone then? I am 1 for 2 on this map. I really like it! I think the Mediterranean has been white both times though, 'cause I never noticed it was there until i read this thread! Hi folks! I'm not sure if this thread is dead but I'll write in anyway. I'm considering a return to CC very soon, and have just been browsing the maps to see what's been happening for the last year. This map looked interesting, but at first glance, I was not sure if NA1 and AT3 are allowed to attack each other (since there is no arrow connecting these two territories in spite of the other arrows nearby). So I decided on visiting this 'Discussion topic' for some enlightenment. After twenty minutes, I've read through loads of the posts but have not found a definitive answer (in spite of seeing several references along the lines of 'arrows should make it obvious'). Can NA1 and AT3 attack each other? Thanks Natty. Prompt and to the point as ever. Much appreciated. Better borders on "Land and Sea"
I think the continents need a thicker stroke around them (Except for where the passages to the sea are). It is very difficult to tell where you can and cannot cross on this map. Just because regions are touching (which on most maps means you can go that way) doesn't mean you can on this one. There are no real indication that you can't - the arrows when you can cross are not enough. Re: Better borders on "Land and Sea"
BigFuzzyBunny wrote: I think the continents need a thicker stroke around them (Except for where the passages to the sea are). It is very difficult to tell where you can and cannot cross on this map. Just because regions are touching (which on most maps means you can go that way) doesn't mean you can on this one. There are no real indication that you can't - the arrows when you can cross are not enough. 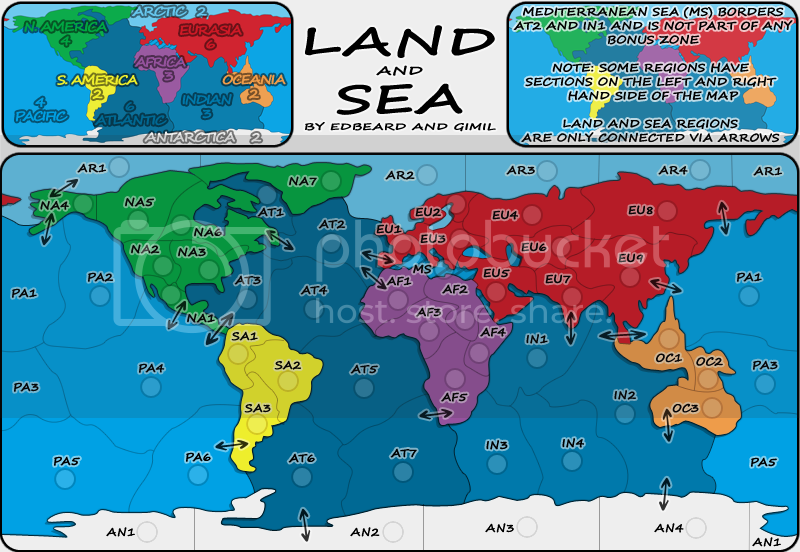 This topic has been merged with the land and sea development thread. If you read the legends it clearly states that land and sea territories can only be crossed via the arrows present on the map. It is the first rule in the legends and makes it quite clear that land and sea regions are not connect just because they touch. Hope this clear things up for you.